Whilst the floor was drying, I started to read the manual for Big Brother. I learned what a few things are, how to use certain features and how to thread the thing (although I cannot get the automatic needle threader to thread! It did it once, and then seemed to decide that that was quite enough for one weekend…) Nothing daunted, I cut a piece of leftover front fabric, back fabric and batting and worked out how to attach the walking foot. This morning I did a whole 2 practice lines on this baby quilt, and then proceeded to quilt the entire ATS quilt this afternoon, before binding it this evening after dinner – phew! I’m quite certain I couldn’t have done this on Baby Brother, I would never have got the volume of quilt through the throat to be able to quilt it, and the pivot feature on Big Brother is fab! Anyway, without further ado (and forgiving the furry watchfuls and odds and sods around my sofa) here is the finished quilt. I hope to get better photos at my gran’s after I give it to her, but since her birthday isn’t until November, I wouldn’t be waiting on the edge of my seat for them if I were you ;o) I promise it lies completely flat, I’m just not that good at spreading it out, and my sofa is too small to show it all! Finally, Susan, at Canadian Abroad, is having a giveaway of 8 FQs of Punctuation, by American Jane for Moda, so pop over and join in. Yea Katy – just got there! The quilt is gorgeous and congrats on Big Brother turning up. I am loving the thread cutter on mine – makes life soooo easy, and I haven`t worked out the needle threader yet! What a wonderful quilt you created. Your Gran is going to be thrilled. Thanks for the name check 🙂 the fabrics look lovely in that photo! Look forward to seeing what you can make with them. husband can't work my auto threader: I tnink he pushes slowly whereas I thump it down, and it works! 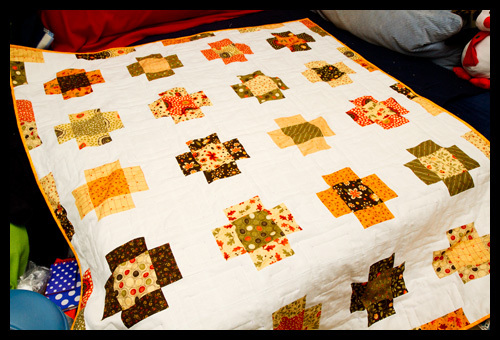 Your ATS quilt really turned out beautiful. Your gram is gonna love it! You would have to be the best relative to have..all the wonderful presents you make for your family, they are just beautiful and from the heart is the best part. 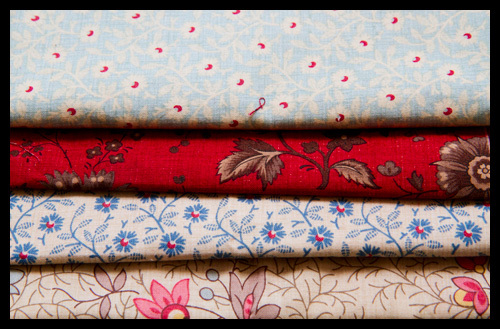 Your Gran will be wrapped in love when she cuddles that quilt.It is lovely. 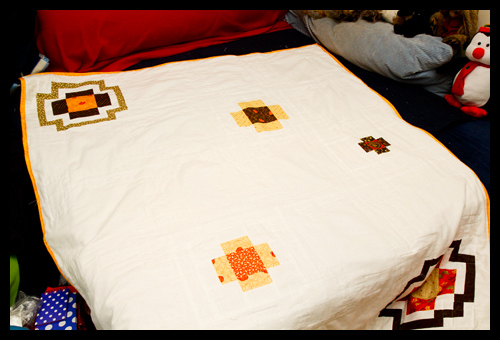 The quilt is lovely and if I were your gram I would be thrilled getting it. Big Brother has an auto threader? Now I'm sure I want one. I can't see the darn holes in the needles any more so sewing is slow going. Can't wait to see what you're going to do with the fabric.